Happy first Tuesday of February!! Hope you are safe and warm in your corner of the world!! This week the SHOPPING OUR STASH crew are Gettin' Inky and we'd like you to join in by using your very oldest ink! For me this was an easy one, the very first ink I ever bought (and still have) is a Memento Tuxedo Black ink pad...it's like Frank's hot sauce, I use that shite on everything!! This is a two-fer card (dontchya just love those??? )...not only is this my card for this week's challenge, but it's also one of the Valentine cards I will be making at work this week with some of my co-workers! 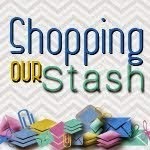 Visit the SHOPPING OUR STASH BLOG for all the details on the challenge and be sure to show some crafty lovin' for my teammates! A CAS masterpiece! Love this card and those fab people stamps! Your co-workers will love this! 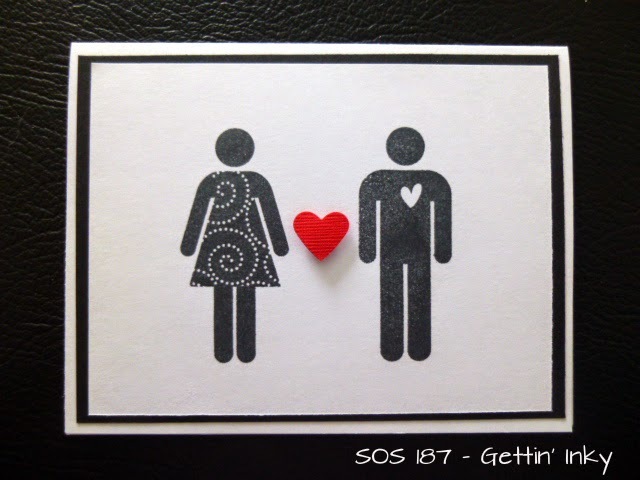 Super cute valentine card, fab job with the CAS. Ooh, clean and simple and perfect. Although simple's not really fair; it takes work to make a card this good! CAS perfection! Love the fancy potty people!